As you might imagine from this artpack’s name, it’s a set of modular room and hallway components that you place on the background of your choice to create a dungeon layout. If you’ve played around with Vry’s dungeon tiles*, Torstan’s Dungeon Tiles or FUM’s “ACS: Dungeon Basic Set”, you’re already familiar with the concept. * This link will only work for users who have registered on these forums. 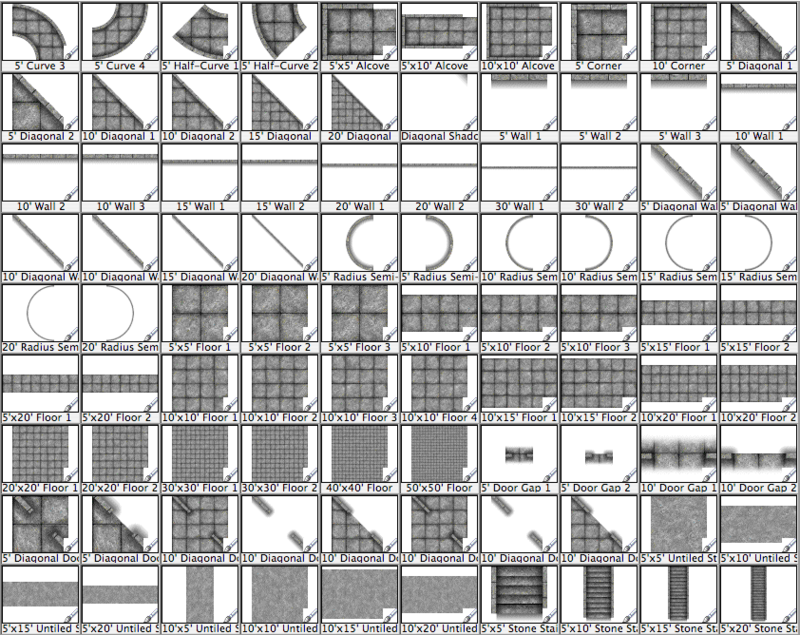 All the components in this artpack are homogeneous (i.e. created in the same style) and designed to tile with each other as seamlessly as possible. The components are all high-resolution (122 pixels per cell), so they won’t pixelate even at full zoom in Battlegrounds. 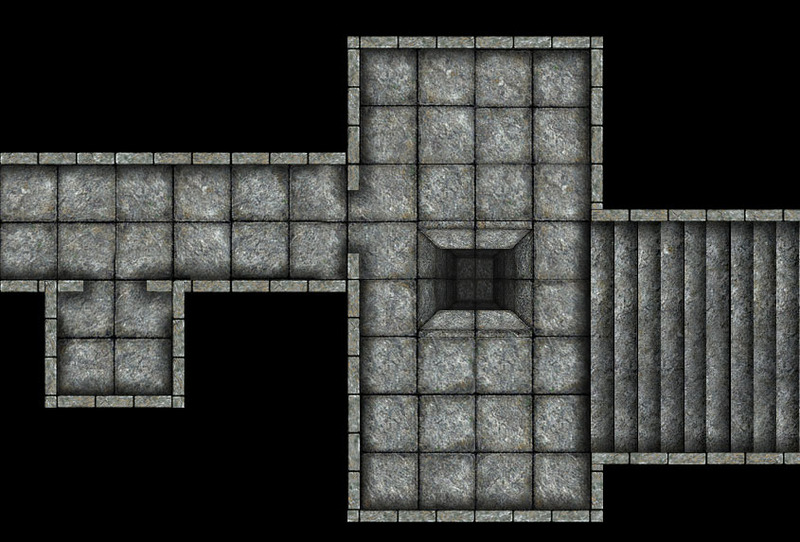 In addition to rooms and hallways of various sizes, the artpack also contains doorway overlays, hallway bends & intersections, stairways, pits, columns, caved-in hallway sections, and other goodies to flesh out your dungeons. 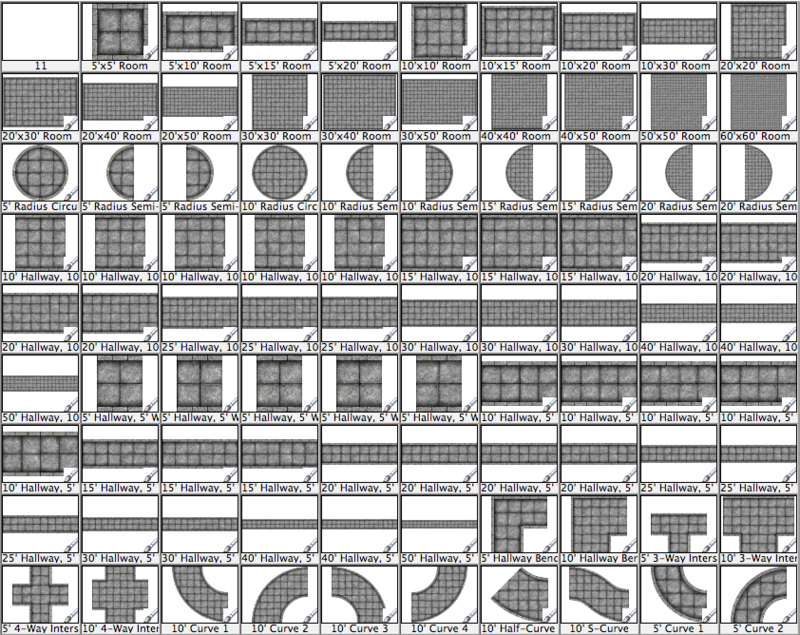 Even standalone floor and wall sections are included, so that you can lay out oddly-shaped rooms. The artpack contains an astounding 234 pieces. This is a “must-have” set for both GM’s who like to improvise on-the-fly and those who like to create elaborate layouts well ahead of game-time. The example shown below is completely bare. In actual use, you would add in things like furniture, blood splatter overlays, cobwebs, debris, etc., to give your dungeons a nice “lived-in” look. 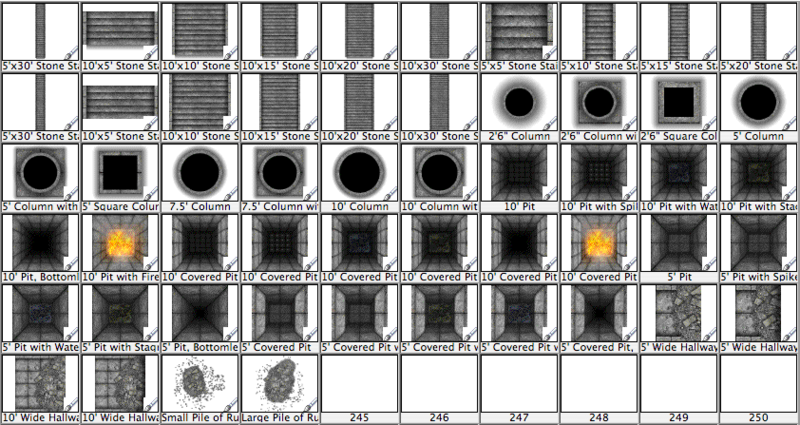 “Component Dungeon Pack 1” costs $10 for GMs (but, like all artpacks, is free for players). Note that players will need to have this artpack installed during sessions where the GM will use it, and everyone should be using BRPG v1.8b or higher, or BGE v1.5 or higher. The content in this artpack may be improved and/or added to in future releases (perhaps due to user feedback and requests for new components). Purchasing an artpack entitles you to all updates to it, free of charge. The threeimages below show the entire contents of this artpack. Be sure to click on each picture to see it at full size.